The 'Mount BB' task heated up the competition in the Bigg Boss 11 house, with friends Hina and Luv fighting with each other, and Akash and Vikas being among the first two to lose their claim to the 'Ticket to Grand Finale'. Thursday night’s episode of Bigg Boss 11 begins with Shilpa telling Puneesh and Luv that Vikas is a mastermind even outside the BB house; she insinuates that Vikas' false reassurances led her to stay home for two years (away from work). Akash immediately reports this conversation to Vikas, who in turn swears he had nothing to do with Shilpa's professional hiatus. Vikas further reveals that Shilpa confided to Priyank that everything she told Puneesh and Luv was just an act; Vikas conjectures this was because Shilpa has been nominated for evictions this week. Akash agrees with Vikas' assesment. Meanwhile, the alarm rings for the task and the four contestants — Shilpa, Hina, Luv and Puneesh — again grab their bags and head for the inclined platform and start on the challenge. Hina’s bag weighs the least and she loses her third point, thus being eliminated from the task. Hina indirectly blames Shilpa, claiming that had she teamed up with someone who believed in hard work rather than miracles, they would have had a better showing. Shilpa too loses her third point in the last round and Luv and Puneesh win the task, thereby becoming contenders for the 'Ticket to Finale' task. They are now up against each other in the competition for the precious ticket, and this will impact the total prize money of the season as well. Before that though, some drama: Shilpa, feeling depressed, sleeps in the wardrobe. Puneesh, Akash and Hina are worried for her. 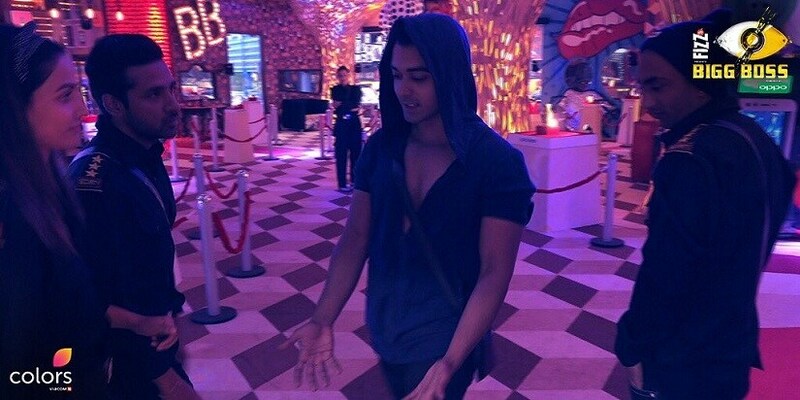 Having previously had a prickly equation, Akash is on friendly terms with Vikas, so Puneesh, Luv and Shilpa think that he will now side with Vikas. Shilpa and Puneesh gossip about Vikas. The next morning, contestants wake up to the song 'Chor Sipahi' and find that the living area has been converted into a museum of sorts. They all start guessing what the task might be, and Shilpa gets it right: She guesses that Luv and Puneesh will be made thieves while the others will be museum guards, and this will be Luv and Puneesh’s 'Ticket To Finale' task. This is just what Bigg Boss says too, when he introduces the task. Among the 'artefacts' in the 'museum are some worth Rs 25 lakhs. If the guards manage to save these, the prize money for season 11 will become Rs 25 lakhs from the current Rs 0. Luv and Puneesh have to individually steal artefacts worth Rs 12.5 lakhs to win the ticket to the finale. Broken artefacts will not be taken into consideration, for either group of contestants. As soon as the task begins, Akash and Hina get into an argument, as do Puneesh, Luv and Shilpa. Puneesh later apologises to Shilpa and presents her a flower. Puneesh, who is playing the thief, now tries his best to take the artefacts and place it in the designated truck outside, but fails every time as he's caught by either Hina or Vikas. Bigg Boss announces that since Puneesh couldn’t steal anything from the 'museum', Rs 25 lakhs have been added to the prize money. Next, it’s time for Luv to be the thief. Since Luv also fails to steal the artefacts, Bigg Boss adds another Rs 25 lakhs to the prize money — bringing the total prize money for season 11 to Rs 50 lakhs. The game will get even more exciting on Friday night, with the four contestants in danger zone — Shilpa, Hina, Vikas and Luv — stepping out of the Bigg Boss house and being taken to a mall where they must appeal to fans to save them from being eliminated this weekend. Stay tuned.